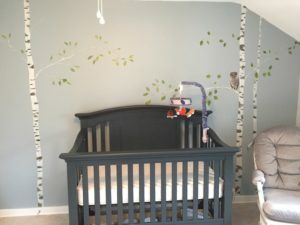 When you are expecting a baby, all kinds of thoughts go through your head for what you want his room to look like. Many ideas are great for a little baby. The truth is you really won’t want to change the design of the room or have time (or money) every few years to redesign when their little personalities shine through. Choose a theme that isn’t just for little babies. I like to use stories that are universal or baby animals that can be revisited at any age as a theme for a nursery. Many cribs now convert from a crib to a toddler bed to a headboard for a twin or full sized bed. These types of choices make good financial sense, as you know that your baby will continue to grow and her needs will change. Choosing a dresser that you can put a changing station on the top will also serve in the future once the changing station is no longer needed and can be removed. Choose a color palette that isn’t “baby” colors. The number of paint colors is boundless! Don’t lock yourself in to traditional “baby” colors unless you have your heart set on them. 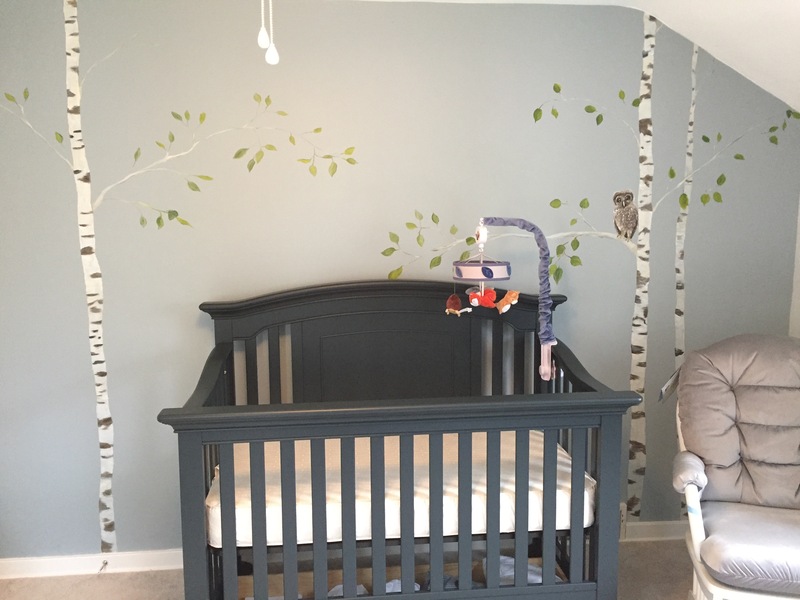 There are many nurseries today making use of neutral colors on the walls so that accessories can be swapped out as the baby grows. If you find bedding that you like for the crib, choose one of the less obvious, background colors for the paint. It will lend a more sophisticated feel and won’t lock you in to a rigid color scheme. If possible, have a bed and a crib in the room. While it might seem a little crowded, having both has some subtle benefits that you might not realize as a new parent. Having a bed allows you to lie down in the room comfortably either for middle of the night feedings or those days when the baby just doesn’t want to be left alone. No one wants to lie on the floor for the night! Later, it allows for an easier transition to a bed. The bed is already a fixture in the room. Most likely the baby turned toddler has hung out on the bed with you and it’s not strange or scary. You can start with naps in the bed and still use the crib for night until the toddler wants to sleep in the bed full time. Then you can remove the crib or break it down to use it as the headboard. Choose fabrics in your color scheme but aren’t married to the theme. There are many kid themed fabrics that will match your room theme perfectly-or not! I always found the theme I chose was not something already in production. Find fabrics that use the colors of your theme but aren’t specifically “baby”. 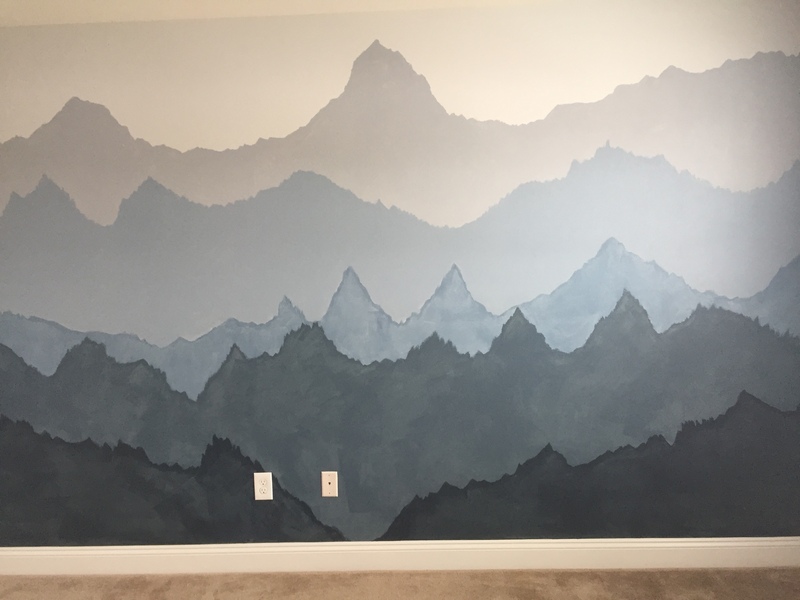 It will give your room a look unique to you and your baby. It will also lend versatility to future choices if you want to change the overall theme but the fabrics can still be used so you can make subtle changes without having to replace everything. I love that neutral doesn’t have to mean boring. The murals you’ve created using nature as inspiration are so soothing. And I totally agree about having a twin bed in the room along with a crib. This was really helpful when my kids were small for all the reasons you listed as well as for an easy place to change their clothes. You are so right. The trend now is for grey walls and the rooms are sophisticated and soothing! Just what you want for baby and mom! Love it! and Love your murals! We had a futon/couch in the baby room and it worked out perfectly for us. They are a bit lower that a regular bed, making it an easy transition for when my daughters where ready to be without the crib. And it was a lifesaver for me when I was just too tired to get back to my room in the middle of the night! We are still using it as a frame with a mattress on top in one of the guest rooms, 20 years later! It is super comfy.